Justus Grimm received his first introductory cello lessons at the age of five at first from his father, followed by studies with Ulrich Voss, Claus Kanngiesser and later with Frans Helmerson in Stockholm and Cologne. He proved his outstanding talent in various competitions. Playing alongside the pianist Florian Wiek, he also won the first prize in the Maria Canals music competition in Barcelona and was also awarded the prize of the German Music Council. Justus Grimm's solo and chamber music performances took him throughout Europe. The beginning of his career in 1993 was marked by his splendid performance as a soloist in the première by Matthias Pintscher's cello concert "La Metamorfosi di Narciso" with the Hamburg Philharmonic Orchestra and continued to maintain his solo performance in cooperation with many other orchestras, including the English Chamber Orchestra, the London Chamber Orchestra, the Orchestre Royal de Wallonie, the Orchestre Symphonique de la Monnaie, the Bonn Classical Philharmonic or the Brandenburg State Orchestra Frankfurt. As part of his performances, Justus Grimm was already a guest in many of the most renowned concert halls in the world like the Berlin Philharmonic, the Music Hall in Hamburg, the Cologne Philharmonic, the Theatre du Chatelet in Paris, the Munich Hercules Hall and the Cultural Centre in Lisbon. In 2012 his performance of Tchaikovsky's "Rococo Variations" with the Orchestre Symphonique de la Monnaie conducted by Carlo Rizzi was broadcast live from the Palais des Beaux Arts in Brussels as part of a TV production. Justus Grimm made his remarkable chamber music career together with renowned artists like Abdel Raman El Bacha, Daniel Blumenthal, Gerard Caussé, Augustin Dumay, Stephen Kovacevich, Katia and Marielle Labeque, Antonio Pappano and Kazushi Ono. He accepted invitations to major festivals, including the Ludwigsburg Festival, the Festival van Vlaanderen, Lisbon's Dias da Musica, the Florilegio Salamanca Festival, Sonoro Romania, Thy Chambermusic Festival, Cantiere Di MontepulcianoBrussel's Klara Music Festival and the Resonances Festival. Besides live recordings by many European radio stations there are already numerous CD records. Worth mentioning here is a CD, Trio Wiek (Christina Fassbender, Justus Grimm and Florian Wiek) with works by Philippe Gaubert, who was awarded a 5/5 rating by the French magazine Diapaison. 2012 saw the recording with earlier works by George Enescu that was highly acclaimed by the international press and shortly thereafter a complete recording of the chamber music works by Cesar Franck, which was awarded the Prix Cecilia as the best CD of the year 2012 by the Belgian press. As a founding member of the Malibran quartet ( www.malibranquartet.com ) he devoted himself to the exceptionally rich repertoire of this genre since 2008. Teaching plays a central role in the artistic life of Justus Grimm. 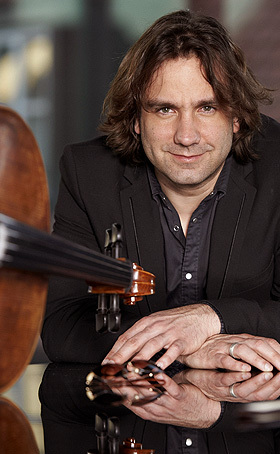 Following tutorship at the Brussels Chapelle Reine Elisabeth (2002-2003) and at the Institut Superieur de Musique de Namur (2003-2008), he held the title as professor for violoncello at the Royal Conservatory of Antwerp in 2008, where he acts also as the Artistical Director since 2013. He plays a violoncello from 2010 of the French violin maker, Christian Bayon.